RIDGID introduces the ability to power all your 18-Volt tools with the new RIDGID 18-Volt Hyper Lithium-Ion Starter Kit. This 18-Volt charger features Rapid Charge Time, Smart Charging, Cold/Hot Warning and Energy Save Mode. This 2.0Ah battery will give the user up to 2X more runtime and has 2X longer life compared to standard Lithium-Ion batteries. This tool comes with a standard 3 year warranty. Free Parts and free service for 3 years. Includes R840086 2.0Ah Battery, R840095 Charger and Operators Manuals. Hue Colour A19 Starter Kit is rated 3.5 out of 5 by 4. Rated 5 out of 5 by Mmv99 from Very good product I like this product very much, it was very easy to install and worth the money I think. Rated 4 out of 5 by Donny from Fun home automation kit This was very easy to set up, just screw in the bulbs and turn on the bridge, it was easy to sync to my iPad. I put a bulb in each of my kid's rooms and they love playing with the colours, right now I also have it set up to do red and green to complement the outdoor Xmas lights. Colour lights in every socket will be overkill, but I will buy more to set up some very visual accents. I have the lights set up to make sure the house looks lived in while I'm away. Also, with HomeKit support, I have confidence the experience will only improve. 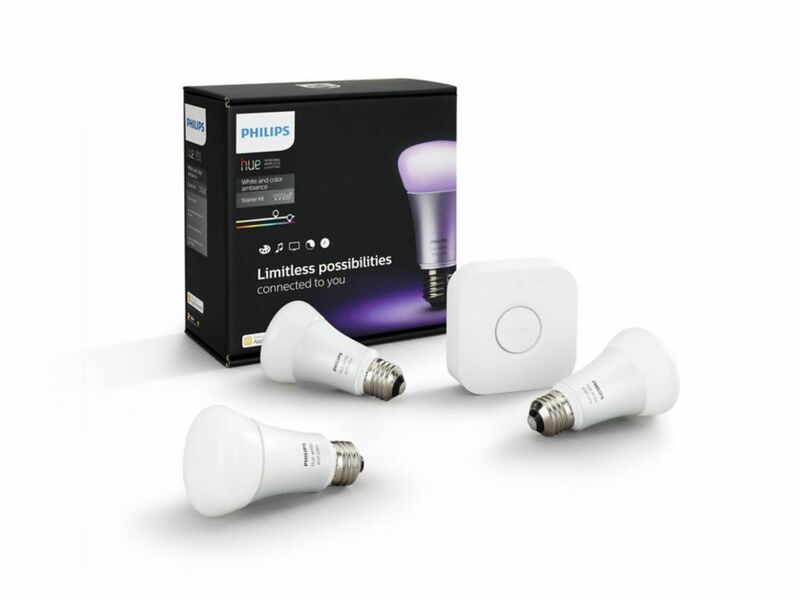 A couple of notes to temper expectations : - The basic Hue app by Philips is very minimal, you can manage your lights with it, but it is not user friendly. The idea behind this system is to be open platform and allow others to perfect the software.... so you will likely end up buying an app to really use these lights. It would have been nice to have that included in the price though. - a downside of this whole system is that they do not have a replacement light switch yet, only a wireless add on, which means you will keep your existing light switches and buy additional wireless ones. Can make for a cluttered wall if you want wireless control for all the bulbs. Rated 4 out of 5 by skunk989 from Easy to setup and great lights I bought this as a gift for my parents, and found it extremely easy to setup and get everything working. The lights themselves have an amazing array of colours, even if some of the default scenes are a little bit gimmicky. The only downside is that a lot of the 3rd party apps for it cost extra, even if it is only a few dollars, but overall, very happy with the purchase, and my parents love it and have since expanded their HUE system.